Leavenworth, Kansas is an easy day trip from our hometown of Kansas City. On an unseasonably warm winter day, we made our way to the “first city” in Kansas to see some new sights. A good day of exploring requires some fuel, which we found at Harbor Lights Coffeehouse & Cafe. After a short drive, we found a spot in their parking lot and made our way inside. The old brick building is decorated on the outside with a “ghost sign”, which are often seen in older downtown areas. (Check out some we found in Galena, Kansas in this article.) The inside of Harbor Lights Coffeehouse has a few seating options. Plenty of tables are available for dining or just socializing over a cup of coffee. Just inside the door, they have some comfy lounging chairs positioned around their fireplace. This looks like a good spot to chill out with a friend. Harbor Lights Coffeehouse has a fairly straightforward breakfast menu. The three main choices are wraps, bagels, and panini sandwiches. All include eggs and options increase from there. For our morning, we decided to order two varieties and split them. On the left is the Sweet & Spicy Panini, which includes egg, sausage, pepper jack cheese, chipotle mayo, and a sweet sauce. The combination of heat and sweet really hit the spot. 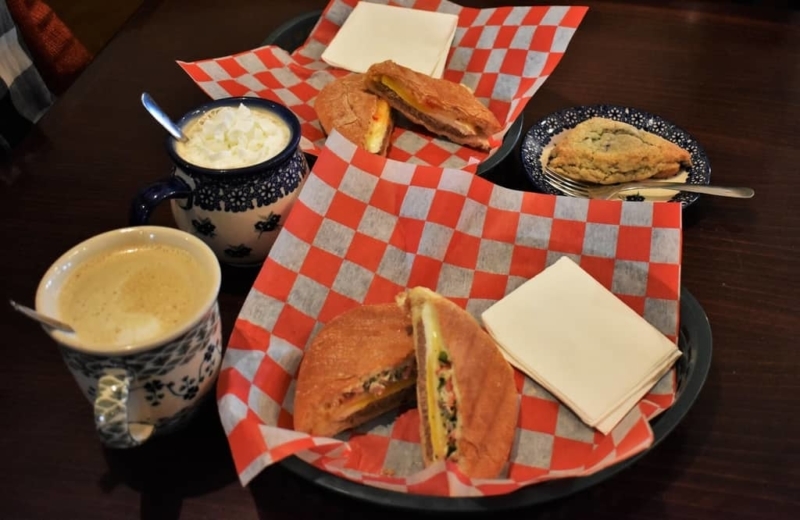 The sammie on the right is their Southwestern Panini. This version also has egg, sausage, pepper jack, and the chipotle mayo. What makes it different is the pico de gallo slathered just under the surface. When we entered, one of the first things we noticed was their dessert case. While it was a little early for these sweets, we did add a Blueberry Scone to our order. Looking over the delicious treats, we noticed a variety of cheesecakes. Some of the flavors included Peppermint, Chocolate peanut butter, and S’mores. 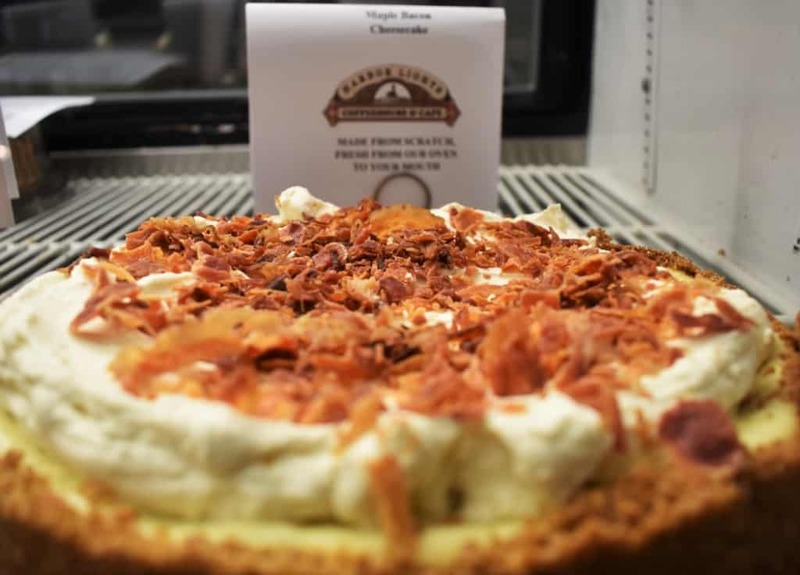 The one that really stood out was the Maple Bacon Cheesecake. Crumbled bacon pieces garnish this sweet and savory dessert option. We will certainly have to be sure to check these out during our next visit to Leavenworth. 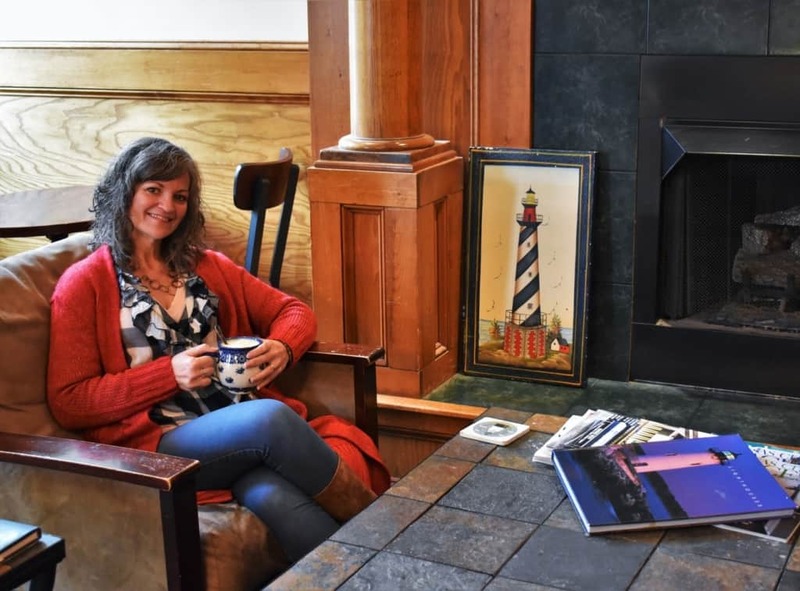 During our visit to Harbor Lights Coffeehouse, it was apparent this was more than a place to just drop by for some coffee. 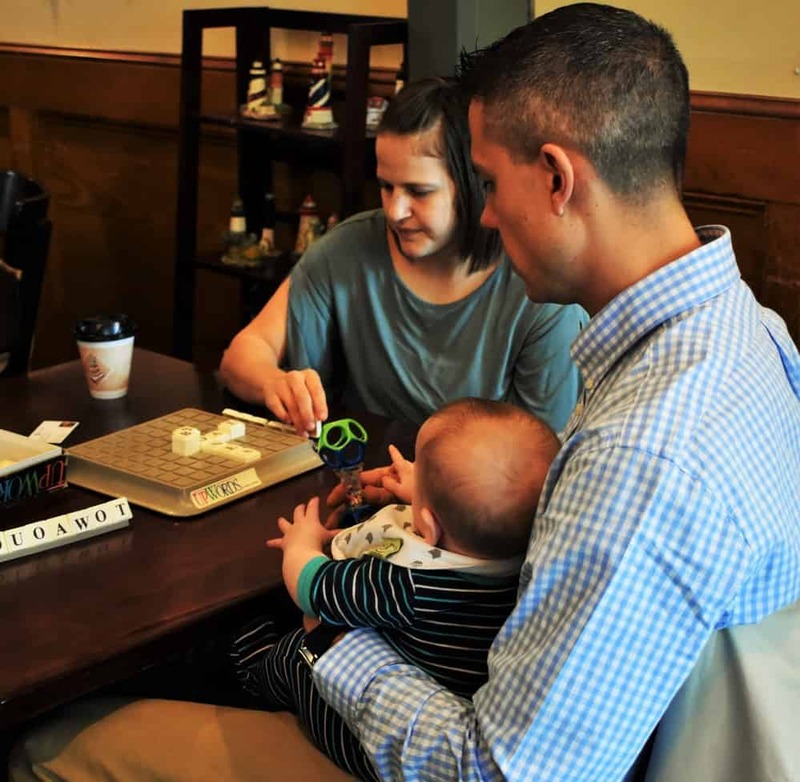 The owners have assembled a number of games and toys for guests to use during their visit. We have seen similar sights at other coffee houses, but here they were actually being used. On either side of us, there were families enjoying some together time in this friendly space. Clearly, we were in one of the locals hangouts. While some of them were certainly curious about our use of a camera, they were also quite willing to accept us into their weekend routine. After finishing our breakfast, we still had a little time to enjoy, before heading to our next stop. Even though the fireplace wasn’t needed on that warm morning, the seating area was still just as comfortable and inviting. Crystal took the opportunity to make herself at home in one of their oversize lounge chairs. 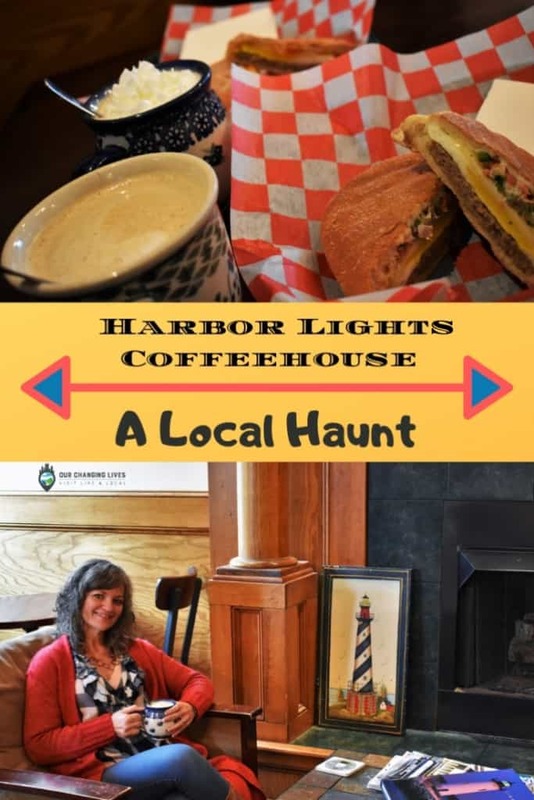 Harbor Lights Coffeehouse has the right combination of good eats, delicious coffees, and an inviting space. It’s easy to see why the locals love this place. You will certainly want to add a visit to your next trip to Leavenworth, Kansas. Yes it was quite surprising.